Hey Parents if you missed the Middle School Pool Party you missed a great time! Not only were the kids fully engaged in the pool, but we had lots of food and community among the parents. But before I make you feel too awful for missing, I know that some of you genuinely couldn’t make it, so I’m offering the information here. The biggest thing I want you to walk away with is that Middle School is a vital time in your kids’ lives. Hormones are racing, choices are rampant, and emotions run high during this time of a student’s life. And as much as they say they don’t need you, they do, and they want you involved. (They show this to you in that endearing way they shove you away when you try to hug them in public.) So don’t check out yet! Get to know the other MS parents. Stay involved in activities (like pool parties, ahem!) that the ministry throws. Attend Parent Forums. Make time to bring them and their friends to mid week events. All of these things, in addition to Sunday morning are strategically planned to support you in your ministry to your children. Below are the two handouts I sent home with families that attended. 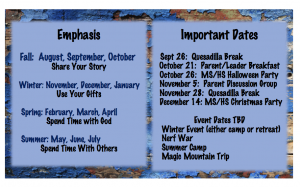 The first is how we split up our teaching calendar to better set a foundation for owning their faith, as opposed to living yours. In addition are important dates to put on your calendar NOW! 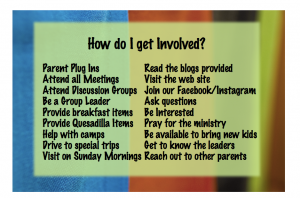 The second is how you can get involved in the ministry. There are LOTS of ways. Thanks for all that you do as parents and for allowing us to come alongside you in your ministry to students.